Prom represents the ultimate in coming-of-age, a rite of passage, an iconic moment in many teens’ lives. Whether your school just calls it “prom”, “junior prom”, or “senior prom” this teen dinner-dance represents the most formal event of the year. When you become an adult, you may believe high school, the drama and angst are long over, but you’ll still be asked, “Did you go to prom?” And what will you respond? We hope “Yes!” because we wouldn’t want you to miss it. Whether you’ve been thinking about going to prom since freshman year (or before) or, if you just decided to go, in your final year of high school, you want to look your best. Be assured that there will be a lot of photographs taken. And those pictures will circulate. They’ll be shared multiple times on social media. You’ll see yourself on Facebook, Tumblr, Instagram, and Snapchat. The point is you want to find a unique prom dress to celebrate your assets and your figure. There are all kinds of avenues to pursue when you’re looking for a dress. A good place to start is the Sherri Hill dresses collection, which offers you stunning, beautifully made dresses, rich in detail and ideal for the prom. • Hourglass (narrow waist) - Choose a dress that accents the waist, and fits closer to the bust and waist. • Pear (heavier lower half, slimmer upper body and waist, bigger hips and thighs) - Emphasize your slender arms and waist; add detail to the top of the dress, keep skirts simple. • Banana (athletic, relatively straight torso) - Modern styling, with emphasis on arms, neck and shoulders. • Apple (wide shoulders, larger bust, thick midriff, narrower hips, slender legs) - Choose flowing fabrics to create symmetry and slenderize. The No. 1 Tip: Make sure your dress fits well. Even the most beautiful gown, from the finest collections in the world has to fit. You wouldn’t want to see your favorite dress reduced to being too loose (there’s no such thing as a “boyfriend prom dress” as in boyfriend-cut jeans) or too tight. A gown that binds will be restrictive; from cutting the cake, to finally sitting down and eating will likely render you unable to clearly state your opinion. 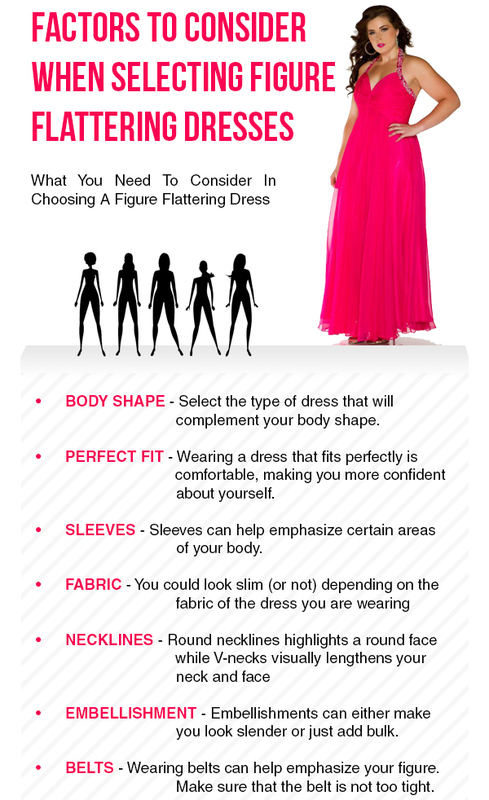 The fabric you choose for your prom dress can make a huge difference in how slimming your dress appears. • Velvet: Because velvet has a nap, with small fibers that protrude, it adds “visual weight”. There’s no argument that beading, pearls, and lace are a beautiful embellishment to your prom dress. Look for more embellishment at the top and bottom – meaning the neckline and hem. Keep in mind if you are full-figured, embellishments at the midriff or hips will add bulk. If you have an hourglass or pear-shaped figure, a wide belt can be flattering and charming. Make sure that your belt – if you choose one – fits well, but it shouldn’t be so tight that it cuts into your waist. This may give you a lot to think about, especially if you have a dress in mind you love, but doesn’t adhere to the above “criteria.” Bring your most objective friend to help you decide and make it a fun outing!